Do not buy, there is no fix if you buy it and do not have sound. Too bad, good books but does not work well on my iPad 2. No sound, tried loading, reloading, etc. no tech support, no refund. But the bundle. Totally worth it! No sound on this app. Disappointing for sure. Bought all books in this app and one 1 works with no tech support or person to contact to fix. Super bummed and for $11.99 I’m irritated! Soooo funny!!! Interactivity is great and the OOPS is hilarious! Thank you for such a fun and educational app! It keeps crashing after the app starts. Please fix that. Read it with my 20 month old. Lots of giggles. Kept his interest for 10 or 15 minutes. App now crashes at the beginning of the book. Please fix! 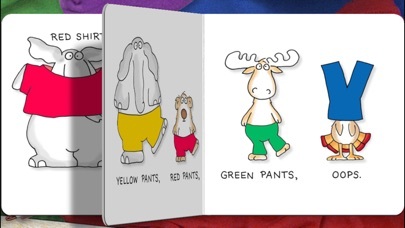 We are in love with the Sandra Boynton books for the IPad! My 3 year old adores all of the interactive features! My daughter loves this book and all the interaction! Thank you to S.H. We found you can dress the turkey and put the clothes away. I would love to see the option of recording our voice for the story as many other children book apps do. Mom and dad use much more expression then the current voice. This book is even better than the normal hard copy because your child can touch each item on the page as it is read/described and it moves! Perfect for my 18 month daughter. NO SOUND! How do you get a refund??? All the books are great! Sandra needs to do more of her books...PLEASE!!!! My kids 3 and 7 love them. It is so much fun to play with the characters and see/hear them do funny things. Please do more of your books!!!! PLEASE!!!! My 3 grandsons love this book! This is one of my favorite boyton books. I love that is now with me at all times. The pages match the book, but with a few bonus interactive things. I like how he jumps in the water at the end. This is a fun book and the app is awesome. Every time you tap something the turkey moves, the clothes move, in one page it even rains and "fills" up the page. At the end all characters can jump in the pool and makes splashes. Great app for preschoolers. enjoyable for the young and the young at heart. 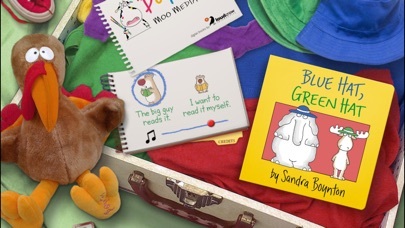 Another great app book by Sandra Boynton! Surprises on every page! I bought this to share with my two grandkids......... I previewed it and found myself laughing at the cute things the animals do and all the discoveries there are for the user. I decided to share it with my third grade class....The kids loved listening to it! Will buy more from this author. 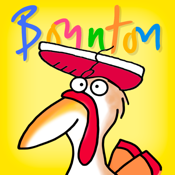 No surprise that a Boynton app is as awesome as a Boynton book! 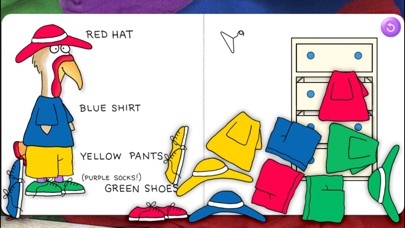 My daughter LOVES "Blue Hat, Green Hat," and when she saw the app, she laughed like she does when she reads the book. It is a thoughtful, developmentally appropriate, calm, and silly app that my 3-year old daughter LOVES. I highly recommend it! In fact, after I bought it, I bought the rest of the Boynton apps on Loud Crow. Congrats to the developing team!! My 2-year-old loves this app! I agree with previous reviewers that the narrator is monotone & boring, but really my son isn't listening to the narrator - he is playing! We played this several times before we found all the fun things you can do on each page. On the shoe page, you can get the characters to walk all the way off the page! My favorite is dressing the turkey in whatever combination you like, and you get to put the extra clothes away in the dresser! Cute & fun for little ones. It is pretty expensive compared to other apps we have which give you a much longer & more in-depth experience. My little girl loves this. It's great to read together or on her own. Lots of little surprises and clever details. It's silly, sweet, a great version of the original book. If you love the humor of the book, you'll love the app. It's sweet and had me actually laughing out loud. The jokes are fun and actually quite surprising. My kids love to come and read through the interactive story. 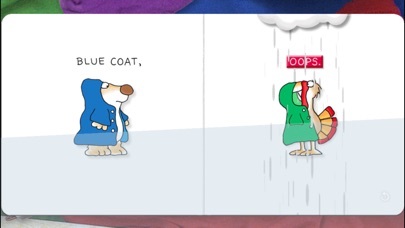 I think all kids books on the ipad should be like this. I only wish there was a way to set the screen differently, showing just one page on a larger screen setting for kids who can't see as easily. The page turning to all the cute animations make this book one of my kids favorite apps. This was my first Boynton book purchase for my iPad. It was the least expensive and definitely worth $1. My 2 year old loves dressing the characters. Very cute!! My grandkids love this book! They love discovering all of the things the book lets them do. They ask to "read" it every time they visit. Great book. I loved this book, now I love this app!!! Tapping the "oops" button on each page brings surprise actions that are sure to tickle kids' sense of humor. What kid doesn't laugh at flying underwear? The gentle repetitive music is a nice contrast to the laughter and giggles that will accompany the reading. This app is so much fun. I'm a speech pathologist and have used the app (and the book) with my students. The pictures are cute without being overdone, and the words and rhythm are engaging. Definitely worth the money. My 2 1/2 year old grand-daughter really likes it but not as well as the other ones, I don't think there are as many different "activities" as in The Going to Bed Book & 3 Singing Pigs. She does enjoy it though & it was well worth the money. I am just wondering if you will be doing But Not the Hippopotamus? In fact she loves the other Boynton books/apps as well It's soo cute she calls them the "Santa Boynton" books These are a must if you have an iPad and little ones. Perfect for all ages! Would expect nothing less from Sandra Boyton!!! Such a clever, interactive book! Love it. All of us in the family love this book/app but since it seems so much shorter I think it'd be at least a dollar or so cheaper. The going to Bed and Barnyard Dance are better. Consider buying it for sure if it goes on sale! Very glad I did not follow the negative review. Could not disagree more. First there are 14 pages not 6. Second each page is chock full of fun stuff. This is probably the best color teaching app I have found in the app store. So well done and fun. I have around 10 Loud Cow apps now because they are so well done. Charlie Brown and Peter Rabbit ones are equally delightful and charming. My 3 yr old son and I love this book so much! My two-year old twins absolutely adore this app, and ask for it by name constantly. 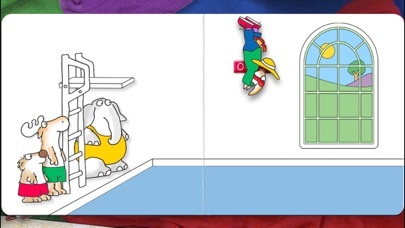 It does a great job of translating the classic board book to an interactive app. Much better than the Pop Up! books for small children, as there is more to do. My only wish is that there was a way to disable the home button, because they keep hitting it and exiting out of the app; however, this is an Apple problem, not a developer problem. This is one of my 4-year old daughter's favorites. She plays with it over and over and likes all the interaction. Your child will enjoy it most if he/she likes being imaginative and playful with this. After our first read through my almost 2 year old asked, “again”? The narrator’s unremarkable reading is perfect for letting the illustrations and animations tell the story. My older children enjoyed this board book when they were young and now the app will allow us all to enjoy it over and over together on-the-go when we need to pass time or cheer up a sad little one.